Hitting back at the government panel that suggested the word “Muslim” be dropped from its name, Aligarh Muslim University (AMU), in its formal response to the University Grants Commission (UGC), has called the proposition “preposterous” for ignoring the institution’s long history and unique character. “The committee incorrectly draws the conclusion that by renaming AMU as Aligarh University would instil secular values. One must recall that in India the concept of secularism arises more from the discourse of justice and equality than from an anti-religious position mostly practiced in the West,” he said in response to the 15 suggestions contained in the audit ordered by the government. As first reported by The Indian Express on October 9, 2017, the above recommendation was mentioned in an audit of AMU by one of five committees set up by the University Grants Commission (UGC) on April 25 last year, at the behest of the HRD Ministry, to probe complaints of irregularities against 10 Central universities. 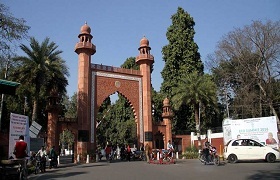 Although the panel’s audit mandate was limited to infrastructure and academic, research and financial operations in the 10 varsities, the report on AMU suggested that the institution should either be called just ‘Aligarh University’ or be named after its founder, Sir Syed Ahmed Khan. According to committee, the presence of the word “Muslim” impinges on the secular character of the university, which is funded by the union government. Reacting to The Indian Express report, HRD Minister Prakash Javadekar had told reporters on October 9, 2017, that the government would not accept the suggestion to rename AMU. The committee had also recommended that the selection process of AMU’s Vice-Chancellor should be tweaked to align it with the appointment procedure followed by other central universities. Currently, AMU has a greater say in appointment process. The university’s Executive Council shortlists a panel of five candidates and forwards it to the AMU Court, which, in turn, selects three names and sends the list to the HRD Ministry. The President then appoints one of the three finalists. The university defended its process saying “it is in line with top class world universities who have all the freedom and autonomy to choose their own V-Cs best suited to them”. “The selection process advised by the panel and followed by other Central universities is neither perfect nor infallible. No one even knows what objective criteria are followed by the search committee in shortlisting the candidates,” AMU’s response states. In response to the committee’s criticism that AMU promotes a culture of “inbreeding” in which a majority of faculty appointments are of its former students, the university cited statistics that 388 teachers have experience of working outside AMU and 237 of its teachers have worked abroad including reputed institutions like Harvard University, University of California, University of Michigan and Washington University. AMU’s audit was done by a committee comprising IIT-Madras professor Shripad Karmalkar, Maharshi Dayanand Saraswati University V-C Kailash Sodani, Guwahati University professor Mazhar Asif and IIM-Bangalore professor Sankarshan Basu. Earlier this year, the government had asked the university for its comments on the observations made in the panel’s report. AMU submitted its response in the last week of June.